Do you want to feel the same sleeping comforts on an outdoor trip or an extra bed for your guest in your home? Then, don’t worry as inflatable mattresses, or Air Mattresses, are made to serve those purposes. In recent few years, various brands are competing among themselves to make more comfortable and more durable mattresses over the time. 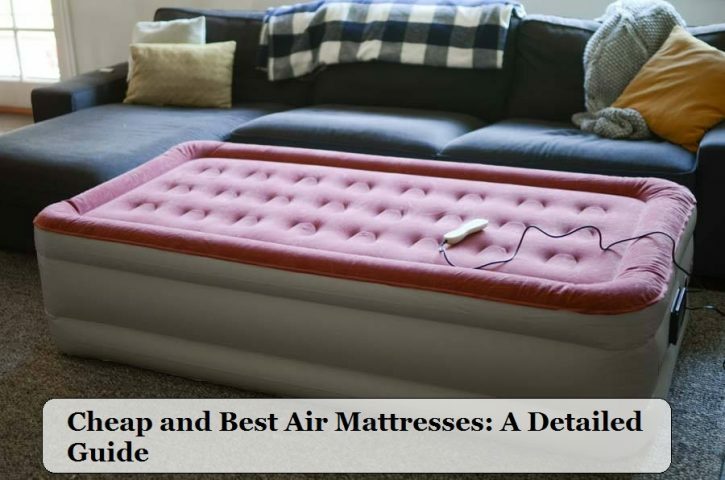 If you are new to this thing and don’t know which air mattress is the best for you, then don’t worry. 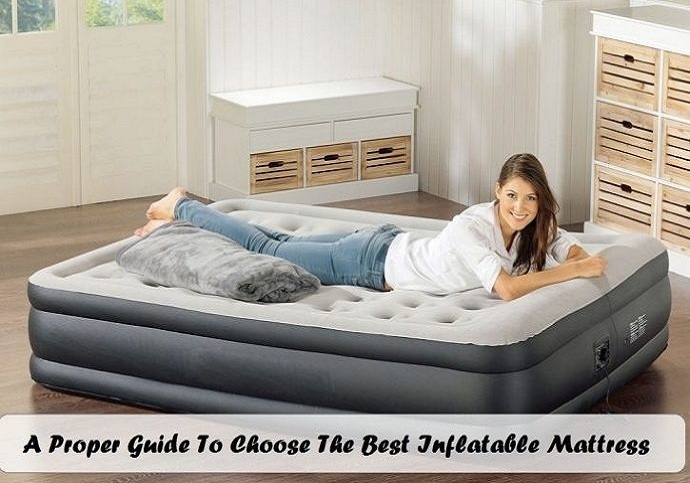 Today, we will give you the complete guide of buying an inflatable mattress and discuss some of the Best Inflatable Mattresses for you. If you are new to this product, then you have to consider a few things before buying an inflatable mattress. So that you can use it for a long time without any worry. Size: Air mattresses come with various names depending on the size, such as King, queen, twin and full. There are also some other differences that can be seen in them rather than only dimensions. So, keep this thing mind when you are buying an air mattress. Another thing which you have to notice regarding the size is the edges. Some inflatable mattresses are not as supportive as traditional mattresses. 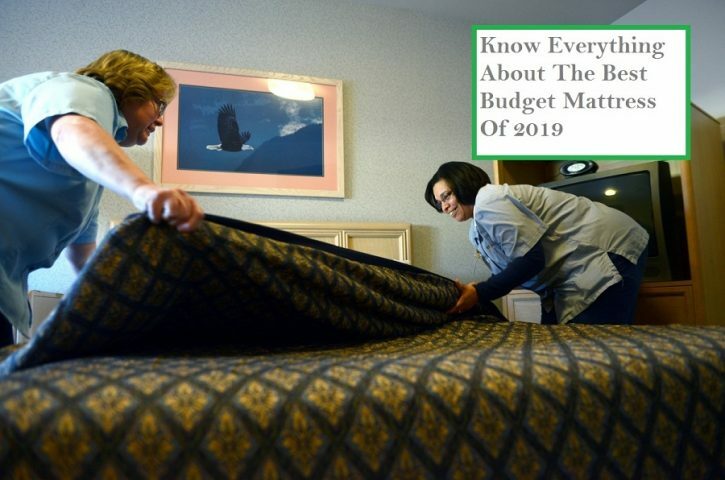 Therefore, always keep your eyes on the edges of the air mattresses when you are buying. I will personally recommend buying a larger mattress for precaution. Thickness: Always notice the thickness of the air mattresses because the thickness of the mattresses can boost the comfort because of the extra air and also it will give you the feeling of a real bed. Another reason to notice the thickness is, it will help you to easily get out because of the height difference from the ground and also help you to stay slightly higher from the ground to give you protection from insects when you are using it for an outdoor trip. Extra Features: Inflatable mattresses come with lots of extra features which can be considered when you are buying one for yourself for additional comfort. Some mattresses come with soft velour or a suede top whereas others provide an uncomfortable PVC material. Soft velour or suede tops are not slippery like PVC which will prevent the chance of sliding down from the side when you are sleeping. 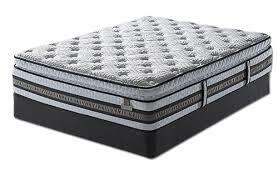 I will advise you to buy the mattresses with one push button pump system but you can also go for the pad. But try to avoid any mattress which doesn’t come with a pump in it. Sensors; to automatically reduce the air pressure to adjust the comforts at recommended settings. Pumping System: Another factor which you can see in almost all the latest inflatable mattresses is an equipped air pump. You maybe have a strong lunge to blow up lots of balloons but it almost impossible to blow up a huge air mattress. That’s where the pumps come in handy for you. 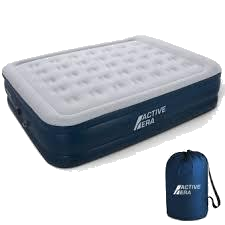 Some air mattress models come with a pad which you use to blow in the air using your leg while others come with a simple push-button system to blow in the air in the mattresses. Storage System: Some airbags come with a storage bag to avoid the storage problem and also to protect the battery, and LED lights from damages. So, if you don’t have a proper storage place, then try to buy an air mattress which comes with a storage bag. 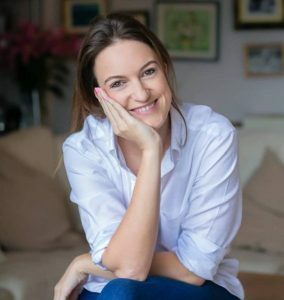 After learning the key points to notice during buying the best inflatable mattress for your home, now I will talk about the best 10 inflatable mattresses available in the market to make your work easy. 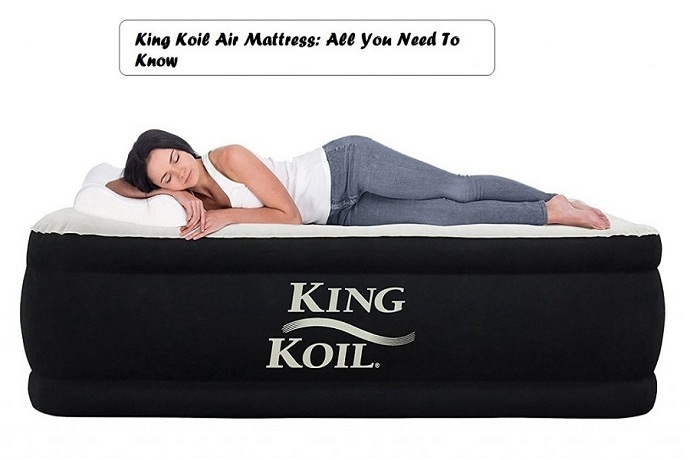 This King Koil mattress is not only comfortable but also considered the best-looking mattress in the market. It has all the features which you can get in other luxury mattresses. Its build materials are tested to ensure durability and comfort. This mattress is so beautiful that it is used globally in high-end hotels. This product comes with a one-year guaranty, a built-in pillow, and a soft flocking layer. It is also waterproof, so no need to take tension of water seepages. Pug in function of the pump allows full inflation in less than 5 minutes. Ideal height from the ground. Soft flocking layer keeps the sheets in place. The heavy weight of the product makes it hard to move. 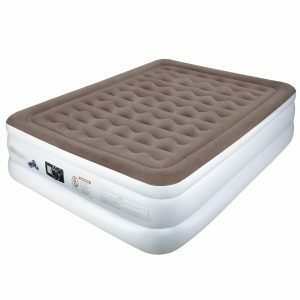 This product is an icon of the luxury air beds. If you want to feel like a king or give your guest luxury treatment, then no doubt this product is the best for you. 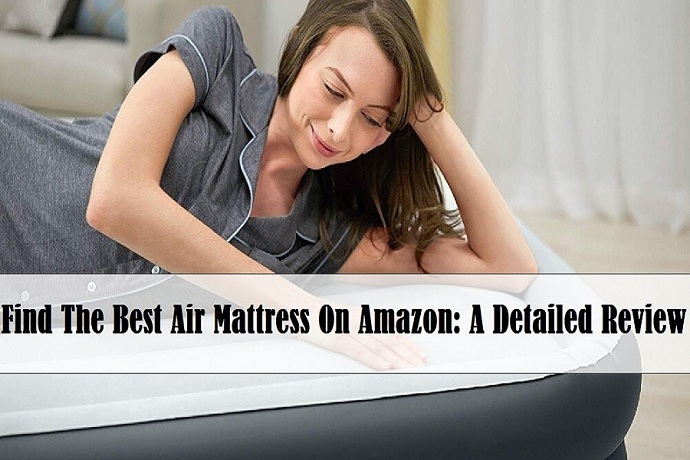 You will get almost all the features you can get in other air-mattress. But you can’t use it for camping purposes because of its heavy weight. Otherwise, this product will always stay at the top of the recommendation list. The SoundAsleep Dream series is well known for its internal air coils. Which helps to enhance the durability and also provides support. It also has an equipped internal pump which starts operating with just one click and can inflate the whole mattress in 5 minutes. This mattress can be used anywhere from home to outdoors. 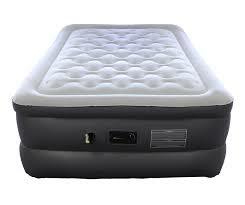 The mattress is constructed with a double height air bed and a dual chamber to let the user modify the comfort level. Also, a sure grip bottom is equipped to make the air mattress stable. 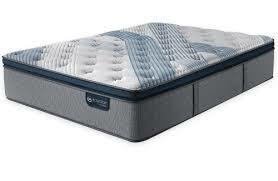 21 internal air coils for durability and maintains the bed surface flat and firm. A one-click-start internal pump makes the full inflation within 5 minutes. It is made with Eco-friendly PVC material for durability. Its base material is puncture-resistant. This product is made with durable material which can hold up to 300 lbs. Its PVC material is slightly slippery. The controller of the inflation is at the side of the bed; so you need to step out of the bed to use it. Separate Air pockets make dimples in the surface of the product which reduces the comfort of the product. The equipped chord is only three feet long, so you need an extension cord to use the pump. If you are looking for a product at a cheap price with high load capacity and suitable for indoor & outdoor use, then no doubt this product will be more than enough to satisfy you. With the help of lamination material, Air Mattress King Size provides better firmness in their product. Other than firmness, this material also provides sturdiness on the edges. If it comes to style, then there is no doubt this product stands in the top in the market. The stylish bed skirt and fitted top sheet make it more than just an air mattress. This bed skirt also provides a critical layer between you and the bed surface which keeps you warmer than an ordinary air mattress. To provide extra security from leakage, Air Mattress King Size use durable material for this product. Laminated vinyl material prevents the product from too much stretching which reduces the risk of a tear. Some said they found the surface of the bed slightly cold at winter. 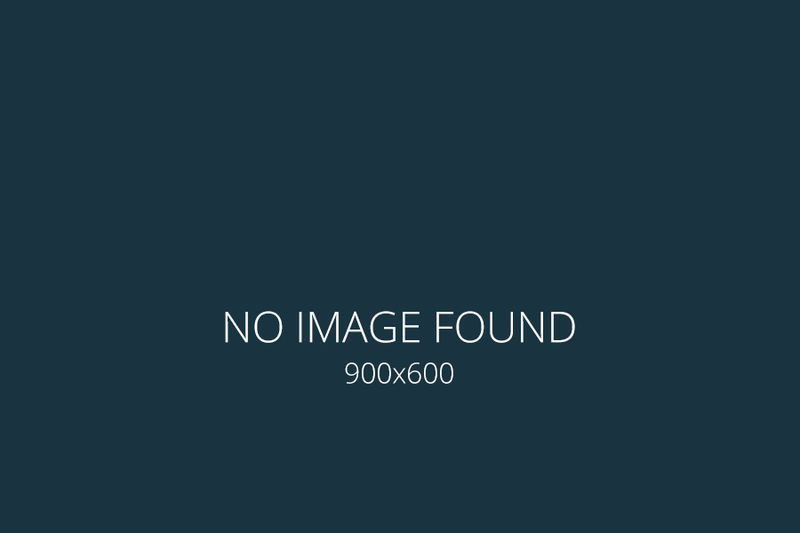 This product is made in a way that it will satisfy any kind of need of a customer. From its built material to its inbuilt features and price, this product passes with the top score in all the aspects. To be honest, their 1-year full guarantee with sixty-day risk-free satisfaction guarantee explain how much they have confidence in the product. The Coleman is a portable queen-size inflatable mattress which is designed to support your everyday needs. Also, its ComfortStrong coil construction gives support to the user’s back and provides the best comfort. An AirTight system is also equipped to prevent any kind of leakage from external damage. The mattress is made with a robust steel cot which is considered one of the best durable materials for a mattress. This mattress can carry up to 600 lbs and its designed to give support to up to 6 feet 2 inches height. To enhance the sleeping support to the user, Coleman designed their airbed and cot in an elevated fashion and also equipped a 4D battery-operated pump to make the inflation easy. From home to outdoor, this product is designed in a way that it can blend into any environment. In-built Airbed and cot enhance the comfort and support to the sleeping. Two-side table with cup holder is equipped to keep your drinks and personal items near you. Foldable steel frame design makes the mattress compact and easy to store. 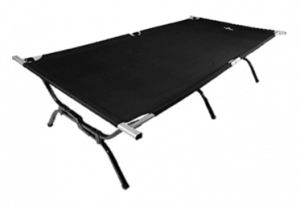 Both-side attached table gives the feeling of a conventional bed and comes handy when you are doing an outdoor trip. It’s quite expensive than another air mattress in the market. Its ComfortStrong coil construction, a steel frame body, attached table, and an electric pump are more than what you need for an air mattress. But one of the downsides of this product is, it is a little bit expensive and you can get many other products in this price range. The Fox Airbed is a multipurpose Inflatable mattress which you can use for camping, guests and regular uses also. It provides a layer of plush in the product which makes it look like a traditional bed. This product is made with rich fabric like cotton, silk, and wool to boost comfort. It also comes with an air-flow chamber in the pillow top which is 40% thicker than vinyl and a built-in two-way pump. Its external pump and a deluxe release valve make the inflation easy. Can be inflated with hot or cold air. The vinyl material is hard to repair when it gets a tear. This multi-purpose mattress can be used anywhere and comes with a traditional bed look. 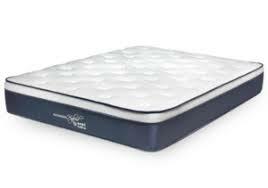 Its top mattress gets hot sometimes which is a blessing if you are living in a cold country but a major problem for others. Some claim that its electrical pump makes slight noises during inflation which is a minor problem and can be neglected unless you are a perfectionist. Serta SZ is a well-known brand in the market for a long time. If you are trying to buy a queen size bed for your guest or your family without it taking up too much space in your house, then this product is perfect for you. 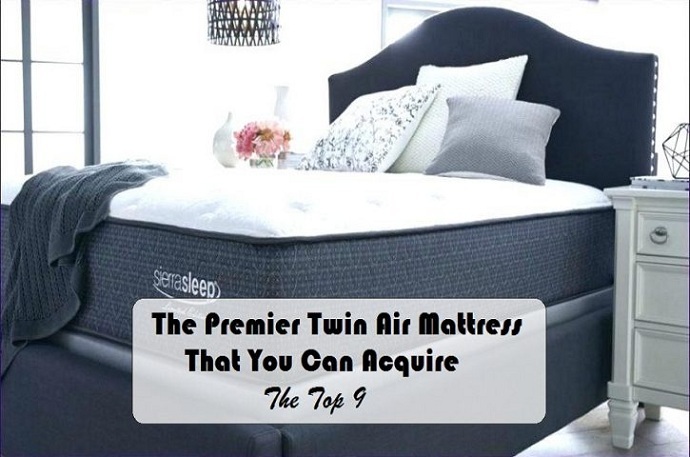 It comes with forty-eight circular coils to give you the best sleeping experience and a soft flocked top is equipped to hold the bedding in place. Thanks to its latest technology, you can easily self-deploy it by plugging it into the wall and switching it on. Its built-in feature makes the product a little bit weighty, but so what? The rolling storage case can easily solve the problem for you. It is built with high-quality material which doesn’t stretch when it becomes warm, which makes the product durable and long-lasting. It comes equipped with a rolling storage case (dimensions are 34” x 15” x 22”). Primary pump automatically inflates the mattress in less than 5 minutes. It comes with a comfort adjustment switch, which lets you set the comfort level to a firm, medium or plush. Advanced technology and self-deploying design allow an easy set up just by simply plugging into the wall. A durable flocked top is provided to give you better comfort and keeps the sheets in place. It has a comfortable design and the circular coils give you the exact feeling of a regular bed. Has better air retention percentage compared to the other inflatable mattresses. Not to mention, its stylish design gives the finishing touch to its perfection list. This product is heavier than most of the other air mattresses. If you are looking for a queen size bed with zero set up problem and easy transportation features, then no doubt this product is the best buy for you. With its auto set up feature and rolling bag, this product somehow becomes unique in the mid-range section. 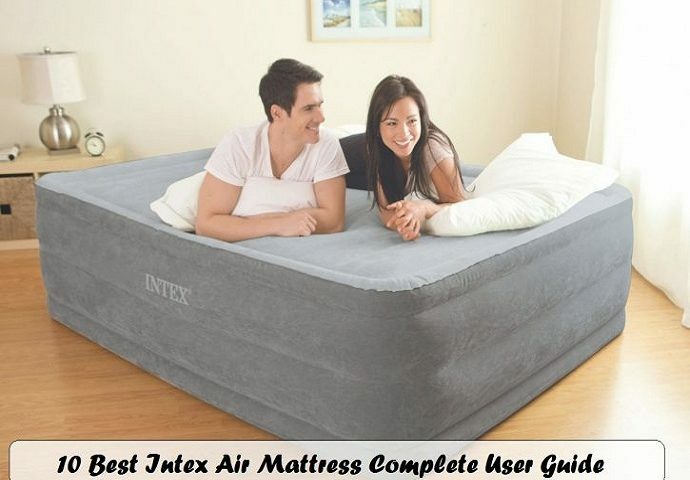 Intex Comfort has been making home air mattress for a long time and is well known for their years of lasting comfort, design, and high-performance built-in features. It also maintains the trend and its Fiber-tech construction makes the product durable and comfortable at the same time. This also helps to carry up to 600 pounds of load. A powerful built-in pump makes the inflation process quick and easy. Its flocked top is made with waterproof materials and thirteen inches floor top bed surface height make the getting in and getting out process easy. The side of the bed is designed in a way that it will prevent the sheets from slipping out. It also comes with the package so that you can easily store it in and carry anywhere you want. It is constructed with advanced Fiber-Tech technology. Its powerful pump makes the inflation easy and quick. To be exact, it can fully inflate the product within 3 minutes. The top of the air bed comes with a waterproof material. Its Dura-beam technology raises the bed height to 13 inches from the ground so that you can easily get in and get out from the bed. 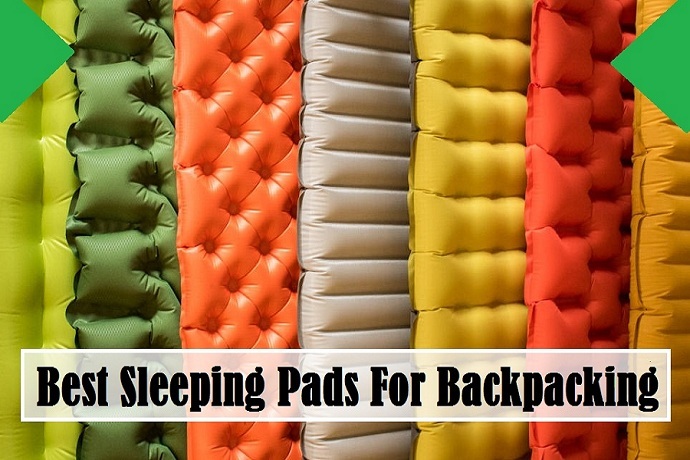 It is designed in a way that you don’t need to take the tension of slipping off the bed sheet when you are sleeping. Its base material carries up to 600 pounds, more than enough for 2 adult persons and a child. A duffel bag comes with the product to sort out storage and transportation problems. Its comfort level can be adjusted to your preferred firmness. This product gets easily damaged if the user tries to inflate it in a wrong way. With fiber-tech technology, dual pump, and dual-beam design, this product is a style statement. From easy inflation & deflation to auto air pressure maintenance technology, this product has all the latest features in it. Not to mention, its high load carry capacity makes it an ideal bed for a couple with a child. But the most surprising thing about this product is that Intex gives all these luxurious features at a very cheap price which makes it affordable for a larger percentage of customers. Keeping in mind the user needs and problems, Etekcity makes its mattresses with nontoxic materials and a comfortable flocking top. An extra thick layer of 0.4 mm of PVC and a 0.2 mm of flocking top is used to make the bed stable without compromising its comfort. Its skid-free design holds the bed in its place when you try to move and double high structure prevents extra strain on your legs and back and gives the feeling of a usual bed and also designed to avoid any leakage. The flocked top keeps the sheets from slippage. It comes with an electrical pump to inflate and deflate the airbed within 5 minutes just in one touch. Power cable can be stored in the air beds at separate compartments to save the storage space. 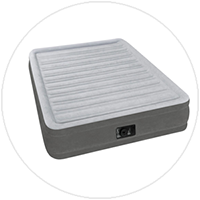 Double layer, puncture-resistant material maintain the air bed form. Its base material and heavy-duty construction can carry up to 550 pounds. This product is expensive but it’s not more than what its features are worth. WonderSleep Classic Series Air Mattress is designed for home uses. A powerful ETL certified rotary pump is included in the package for fast inflation. For better comfort, this product is made with enhanced PVC and top flocking. For further comfortness in the back and durability, the manufacturer uses 7 x 5 array air coils. Its DreamCoil technology maintains the firmness of the bed so that you can enjoy your sleep without any disturbance. Its extra thick, waterproof, puncture resistance and multi-layer material make it usable on any surface which makes it the best product for an outdoor trip. Its extra thick, waterproof flocked top with a multilayer, puncture-resistant material, reinforced bottom that prevents the mattress from sliding around on your carpet. This makes it a complete package of comfort and durability. A 1-year warranty also comes with the package to give you assistance from early damage. DreamCoil technology gives you comfortable support if you are suffering from back pain. The pump makes noises during inflation. This product is one of the best in the mid-range section. It comes with a proper balance of style, comfort, and feature, and doesn’t have any luxury additional feature to make the price unnecessarily high. A complete kit of leak repair, manual and a storage bag make it a perfect product for the average household. If you search about the Best Inflatable Mattress, then you will surely find Insta-Bed in the top list . They are making inflated mattresses for ages and are well known for their high quality and affordability. This product is also a good example of that. It comes with a high load capacity up to five hundred pounds and has an ideal ground-to-top height. A three-level firmness adjustment feature and a powerful internal AC pump with Never Flat technology give you the best sleeping experience of your life. Its advanced neverFLAT technology monitors the air pressure and controls it silently whole night. 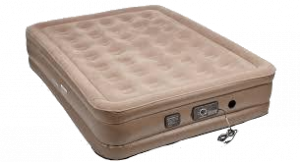 The new addition, auto-shutoff feature turns off the pump when the airbed is fully inflated at the desired comfort level. 18” ground to top height makes getting in and out easy. A carrying bag also comes with this product to provide you with an easy storage place. Its flocked surface does not provide great insulation. So, if you want to feel the warmth, then you have to buy it separately, which means extra cost. Hope my article is able to guide you to select the Best Inflatable Mattress for your home.